Bed sheets can be an awesome resource for cosplayers. 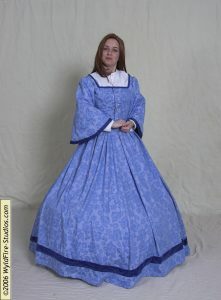 They’re useful for mockups, flat-lining and even making some garments – I made a hoopskirt and matching bodice out of fancy sheet set from Target and they looked great. Previously-owned sheets have done all their shrinking and bleeding in previous washings, so no nasty surprises await you in that regard. And, when bought at the thrift store, sheets can be cheap. Like, $4 for a king-size sheet, versus paying that much for a single yard of 45″ wide muslin at most fabric stores – and the sheets are often of better quality, too! That said, there are a few pitfalls to using them, so here’s what I’ve picked up – learn from my mistakes, etc. Check the sheet’s label for fiber content. If you’re making a mockup, the yarns might not matter to you, but if you’re intending to use that pretty print for a pair of bloomers or a chemise, you want to be sure that it’s pure cotton next to your skin! Wash your sheets before you cut them. Yes, your sheet has done all of its shrinking and bleeding but there’s no accounting for how your sheet will smell after sitting in a thrift store for whoever knows how long. Trust me on this (ugh). Think twice before using any stretch or “tee-shirt fabric” sheets. Those are a jersey knit and can be challenging to sew. They also won’t fit you the same as a woven fabric, nor are they a good choice for flat-lining. Of course, if you need to make a mockup of a garment that’s going to be made from lycra or such in its final form, then a jersey sheet might be just the thing you need. Check the grain of your sheet before cutting – make sure it’s straight and that you know which way to lay your pattern pieces. The easiest way to determine which is the warp and which is the weft is to pick the sheet up at two points about a foot apart and tug it along the length of the threads. The weft threads will give just a bit more than the warp. The warp threads are always the stronger ones. Don’t tug on the diagonal – that’s the bias – unless you’re looking to mock-up a bias-cut gown, of course. A quick-and-dirty way to help lay pieces out is, once you’re sure which way is the warp and the weft, put a little snip in to the edge of your sheet running parallel to the weft (across the warp). Now take a hold of either side of that snip and TEAR. The fabric will tear cleanly along the weft – you might get a couple of loose threads, but as long as the sheet was well made, no more than that. That torn bottom edge is your starting point for adjusting the grain, if necessary. Salvage any lace trim off your thrift-store finds. It takes quite a bit of yardage to trim a bed-sheet and you’ll have a use for it, eventually. I’ve got about four yards of rather nice cotton eyelet taken off a queen-sized sheet awaiting a new life as trimming on a petticoat. Keep a stash of several sheets of varying weights in your stash, so you’ll always have plenty of fabric at a moment’s notice. When my cash-flow has crunched, I’ve satisfied the urge to sew with making mockups (and historical underthings) out of my sheet stash. Make a habit of visiting your local thrift shops regularly. I’m lucky enough to have one within walking distance of my house, so I toddle over there at least once a week. The good stuff always goes fast! If possible, grab a buddy and plan a “thrift-store crawl” featuring several stops in a single day. My local costumer’s group has an annual outing nicknamed “Goodwill Hunting” and it’s a blast. Use the cheapest sheets you can find. Very cheap sheets can be thin and thin fabric won’t work for your mockups as they won’t duplicate the bulk of your final fabric and the final garment won’t fit right. And super-lightweight sheets won’t add any body when flat-lining a garment, either. Hold the potential purchase up to the light pay attention to how heavy it feels, off the hanger, to determine if it’s adequate to your needs. Caveat! It’s been pointed out to me that very-lightweight bedsheets can take the place of cotton lawn and voile, in a pinch, and can be suitable for historical undies, Regency dresses and dainty accessories. Assume that there’s a straight-up correlation between square inches in a bed sheet and square inches in a yard of fabric. A single yard of 45″ wide fabric is 1620 square inches. A queen-sized bed sheet is 9180 square inches. Does that mean that a queen sized sheet is the same as 5.6 yards of fabric? Not quite. Depending on the garment you’re cutting – the size of the pieces, whether or not they have to be on the grain, etc, you can’t blithely assume that a single sheet will yield, say, two pairs of pants. Always pin your entire pattern to a sheet before cutting. Buy sheets that are smaller than full/queen size, unless the fabric really is fantastic, or your selection really is that limited. A lot of my projects are fabric-hogs – hello, 19th century! – and I can’t be sure that a twin-sized or kid’s bed sheet will give me enough fabric. Buy anything other than pure cotton if you can help it. Life’s too short for polyester and nylon, even in mockups.